If you’re look for an easy Christmas Craft for Kids then you’re in the the right place. 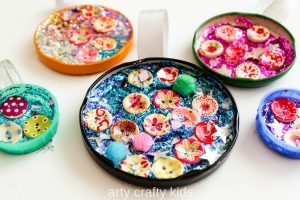 These gorgeous Jar Lid Baubles were made entirely by my two-year old! They’re going to look wonderful on the Christmas Tree. I would like each and every decoration on the tree to be kid-made and from now until Christmas, we shall be making one new ornament, garland or anything else that takes our creative fancy each and every week. 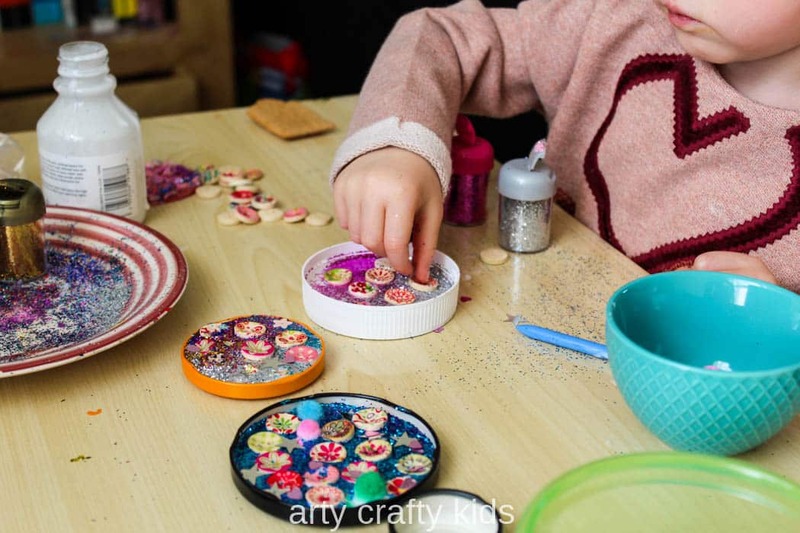 The Christmas crafts will be easy, they will be sparkly and most importantly…KID-MADE! The Christmas Tree itself, adorned with all its Kid-Made creations! 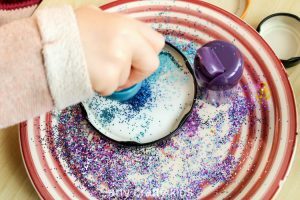 Glitter, sequins, buttons and any other embellishments you have to hand! 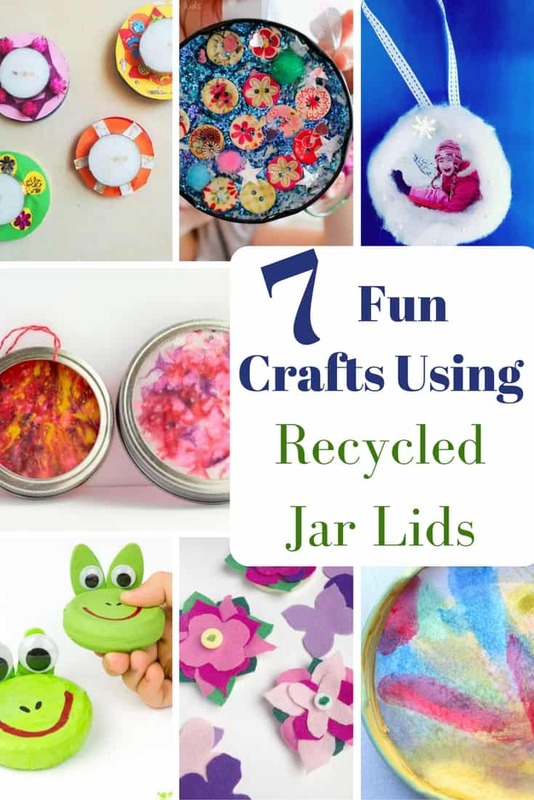 Using a clean jar lid, squeeze a thin layer of glue into the lid until the whole surface area is covered. 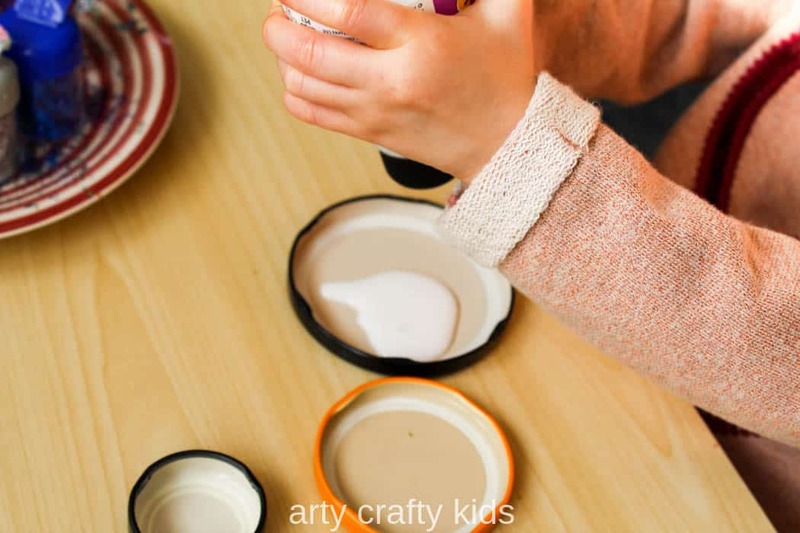 Be careful not to add too much glue, as it will never dry… we learnt the hard way! Add a thin layer of glitter until the glue is covered with sparkles. 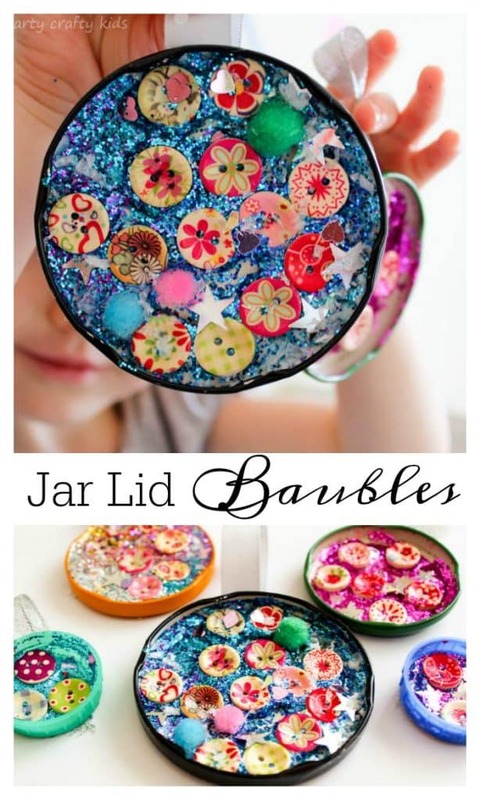 Add the embellishments – they could be buttons, sequins, pom-poms or even cut up tissue paper! And now for the adult bit! Leave the lids to dry and then add a ribbon for hanging to the back, using a strong glue. I used a hot glue gun, but a strong adhesive will be fine. 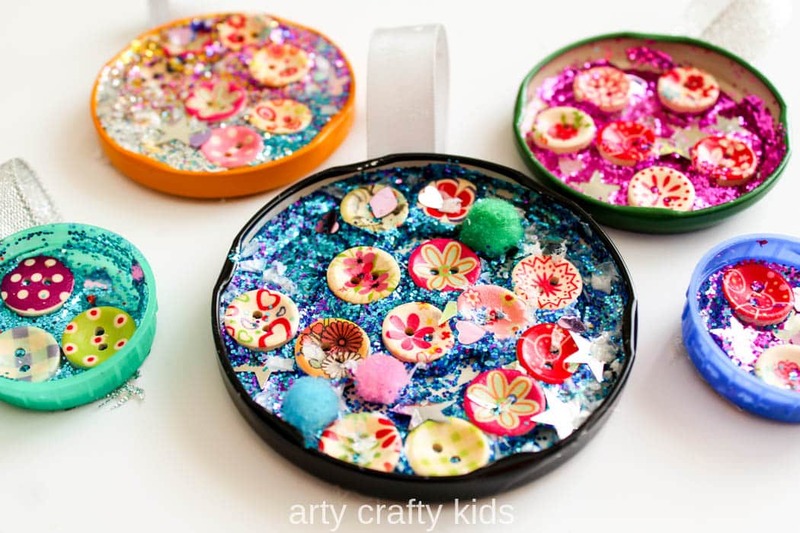 I hope your kids LOVE this easy Christmas craft and their baubles look beautiful, glistening on the Christmas Tree. 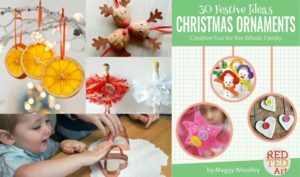 If you’re looking for more Christmas Ornament inspiration, then I have pleasure to recommend a fabulous ebook from Red Ted Art. 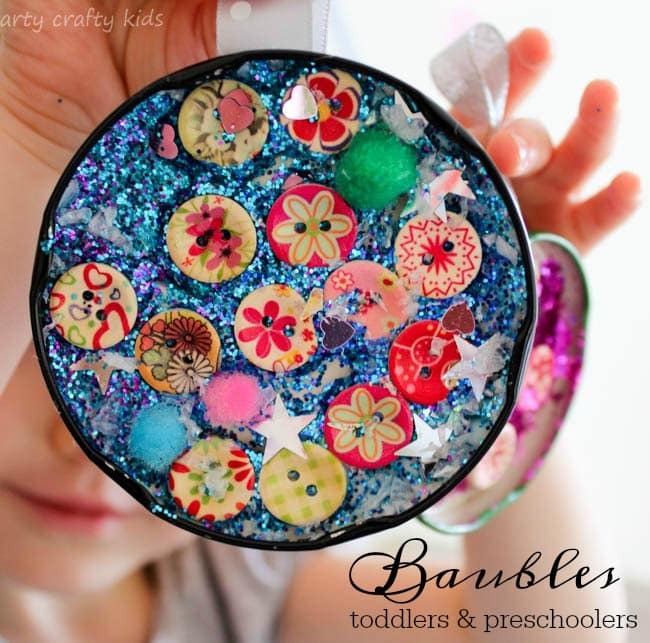 The ornaments are suitable for a broad age group and come with easy to follow instructions, all condensed into one handy book… oh and the ornaments are simply GORGEOUS!